Use butter icing to secure a square vanilla or chocolate cake on a board. Spread with half of 1 quantity butter icing, top with another cake and repeat with the remaining icing and cake. Cut the slab cake in half diagonally to get two triangles. Place on top of the cakes at 5cm (2 in) apart and trim the edges. Use 1 quantity butter icing to ice the cake. To decorate, secure the small chocolate sticks around the edges of the house and 5 chocolate sticks along the top front of the roof. 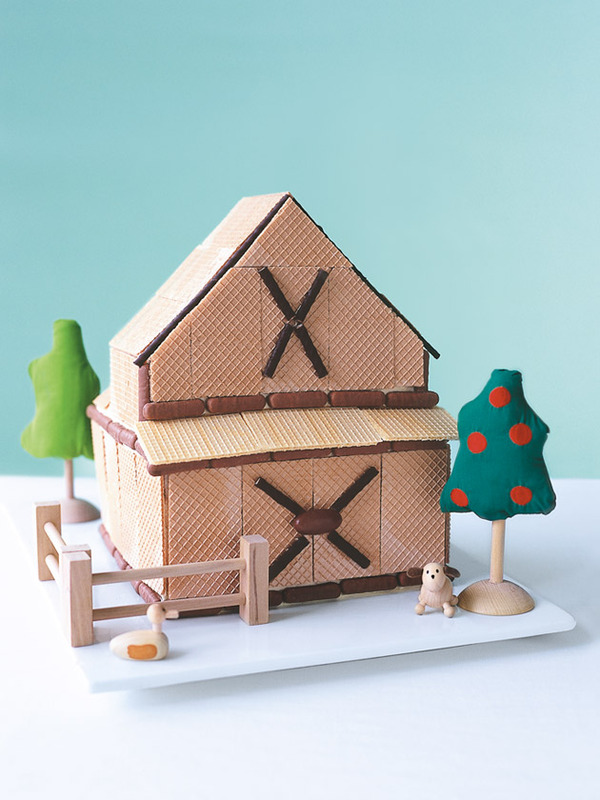 Tile the farmhouse with wafer biscuits. Divide the remaining chocolate sticks and use butter icing to create an attic door, and the other, along with the lolly, on the bottom half to create a front door.